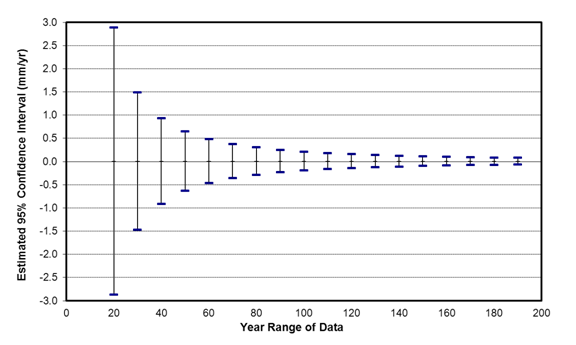 As more data are collected at water level stations, the linear mean sea level trends can be recalculated each year. The figure compares linear mean sea level trends and 95% confidence intervals calculated from the beginning of the station record to recent years (2006-2011). The values do not indicate the trend in each year, but the trend of the entire data period up to that year. Although the mean trend may change from year to year, there is no statistically significant difference between the calculated trends if their 95% confidence intervals overlap. Therefore, the most recent calculated trend is not necessarily more accurate than the previous trends; it is merely a little more precise. If several recent years have anomalously high or low water levels, the values may actually move slightly away from the true long-term linear trend.